This is College Physic Answers with Shaun Dychko. This dolphin is initially travelling at 12 meters per second and he slows down to play with a friend by going only 7.5 meters per second after 2.3 seconds. So the mass of the dolphin is 35 kilograms and what we're going to do is figure out what force the dolphin, you know, exerted on the water which then in turn exerted this force on the dolphin to slow him down. That force is going to be the net force because there are no other horizontal forces. We're told that the buoyant force balances gravity just nicely so they're equal and opposite so they don't need to be part of our analysis. So the net force is mass times acceleration and it is this force we're trying to find. We don't know what the acceleration is but we're going to figure it out using all this data here. Well, this data here anyhow. So acceleration is change in velocity over time and so we'll make a substitution for a using this here. 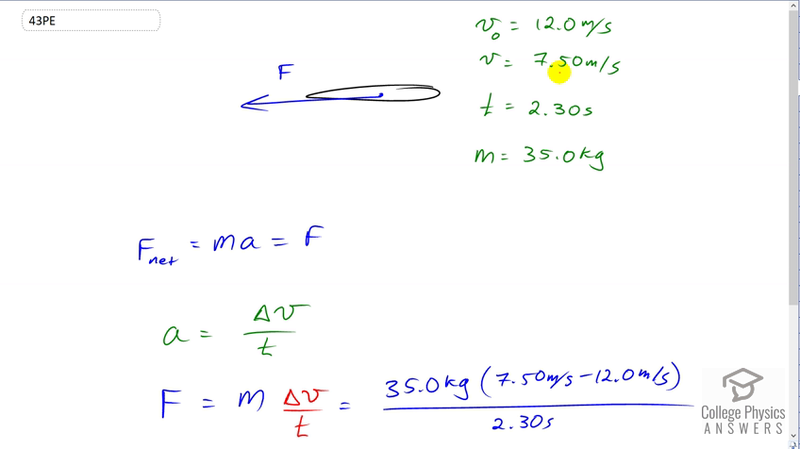 So force is mass times acceleration but that's going to be mass times change in velocity over time. That's 35.0 kilograms times a final velocity of 7.5 meters per second minus and initial velocity of 12, and divided that by 2.3 seconds. That gives us negative 68.5 Newtons.